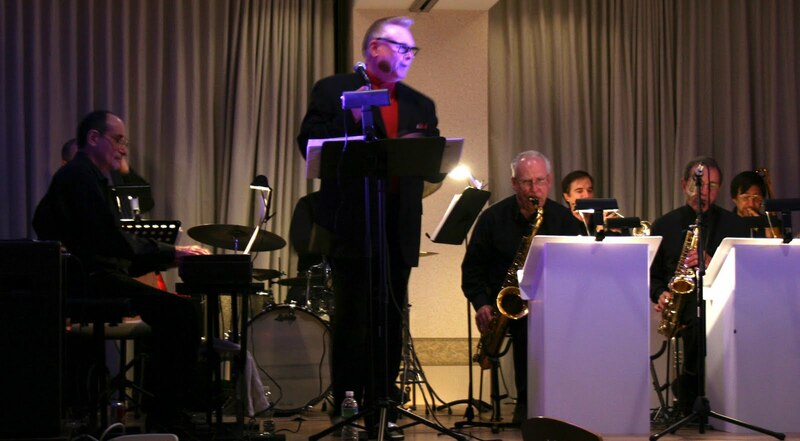 Last night we had a chance to see Pittsburgh's Johnny Angel (sans Halos) perform with the Joe Lagnase Swingtet 8 at a fundraiser for our local library, a cause dear to my heart. 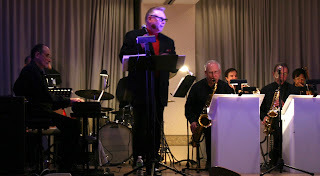 I have to confess that I am a closet Big Band fan and was amazed at how many of the songs I could sing along to: Save the Last Dance for Me, L.O.V.E., The Way You Look Tonight, Days of Wine and Roses and O' Danny Boy. Sitting together in a big room in our community center, we had a good time saying hello to the few people I knew in the crowd and meeting others. My friend's high school-aged son happened to be passing by the door when he said to his mother, "There are a bunch of old people here for something." You will feel a little prick. This morning I had to have blood drawn for my yearly checkup following a 14 hour fast, not my favorite thing to do. Going without food that long is not too much of a big deal, until you actually tell me I can't eat. Then I want to nosh on everything in sight. The blood-taking rules also forbid coffee, which is enough to send me into a catatonic state. My morning routine always includes a cup of coffee before I present myself to the world and the world is very happy that I do that. Saves a lot of wear and tear on other people. The waiting room was pretty full when I got there and then when it seemed to be my turn -- with me clutching my script and insurance card in one hand to save time --the tech called in another man first. What the....? That phlebotomist had no idea how close he came to having an incident in his waiting room! Film at 11. This blog business is hard work. I had to rearrange, copy, paste, delete, add, and pretty much start over at one point. There is such a thing as being too clever I think and I would never want to be accused of that! I will stay away from any more customizing of the blog space for awhile and concentrate on the posts, where I hope you will find something of value and worthy of your taking time to comment. Have at it. This blog is for all of us. Today is a great day. Today I launched a new blog for Baby Boomers and I hope that you will be as excited about it as I am. I have been writing an Ezine for Baby Boomers (and Wannabes) for the past eight years, and thought it was about time I took the leap into another form of social media. We all know that Boomers do not like to be left behind! I hope you will join me often as we try to figure out this Boomer life we lead. Please tell your firends to come along too, because it's true: the more the merrier, always. Check back for news, opinions, thoughts I think I think, and more.